Dr Justen Manasa graduated with a PhD after completing ground-breaking research in the Hlabisa District of KwaZulu-Natal that resulted in a low cost genotyping method envisaged to help doctors monitor and evaluate drug resistance among HIV-infected patients in resource-limited settings. 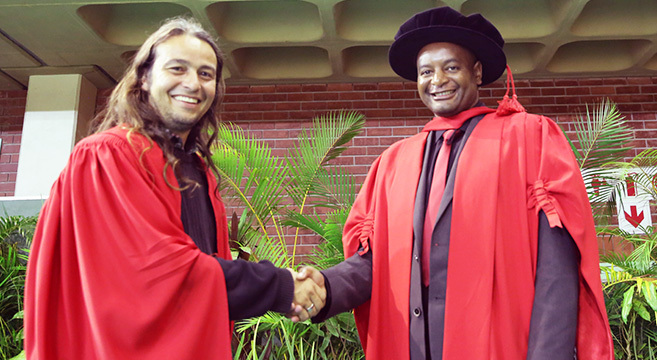 Africa Centres Professor Tulio de Oliveira congratulates Dr Justen Manasa. Supervised by the prolific Programme Director for Genomics at the Wellcome Trust Africa Centre for Health and Population, Professor Tulio de Oliveira, Manasa's study demonstrated a low cost and open access method for HIV drug resistance genotyping which follows a four-stage protocol consisting of RNA extraction, reverse transcription and PCR, sequencing and bioinformatics. Because HIV drug resistance has the potential to derail the progress made in the efforts to control the epidemic, Manasa said it was important to continuously survey and monitor drug resistance in naive patients and patients failing therapy. 'Unfortunately most of the methods used are expensive to implement, especially in the context of the magnitude of the HIV epidemic in sub-Saharan Africa', said Manasa. He said the numbers of patients accessing HIV-1 antiretroviral (ARV) treatment in resource-limited settings had increased exponentially over the past decade. This was accompanied by significant improvements in the quality of life and life expectancy of the patients who are already infected, however, the emergence and spread of HIV-1 drug resistance had the potential to reverse all the efforts made by scientists thus far. His study involved monitoring the temporal changes in HIV drug resistance in patients failing their first line ARV therapy (acquired drug resistance) and those not yet on treatment (transmitted drug resistance) in a rapidly expanding and decentralized public ARV treatment programme between the Department of Health and the Africa Centre for Health and Population in the rural district of Hlabisa. His PhD resulted in the publication of eight manuscripts in peer-reviewed journals, of which five were first author publications. He says he was also fortunate to present some of the work in a plenary session at the International AIDS Conference in Washington, D.C. in 2012. He is a Fellow of the Salzburg Seminar series and a member of the Southern African Society for Human Genetics; the African Society for Laboratory Medicine; the American Society for Microbiology; the International AIDS Society and the Southern Africa Treatment and Resistance Network. Born in Zimbabwe, Manasa said he was very passionate about science and would like to better understand the causes and consequences of HIV drug resistance at individual and population levels in Africa.